News | Rhys Williams | Published: 13:21, Tuesday January 15th, 2019. A primary school in Caerphilly County Borough has received a top national award. Cwmfelinfach Primary School has received a National Quality Award for maintaining and promoting the positive health and wellbeing of pupils and staff. The award is the highest honour a school can be awarded through the Welsh Network of Healthy School Schemes. Since 2005, the school has been involved in the healthy schools programme and has provided dance, cookery and gardening classes to pupils. The school’s Knitting Nannies are a group of grandmothers who have volunteered their time for a number of years to support the school’s curriculum. Each week they teach skills such as sewing and knitting. The pupils of Cwmfelinfach have used the skills they have learned to make a difference in the community – They even made blankets for the Special Care Baby Unit at the Royal Gwent Hospital in Newport. Caerphilly County Borough Council have recognised this fantastic work by granting the group ‘Intergenerational Club’ status – highlighting the partnership between the pupils and the older generation in the community. 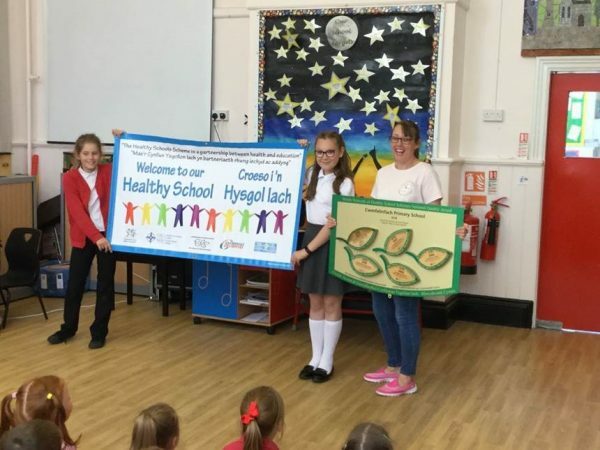 Sarah Andrews, Head of Programme for Healthy Settings at Public Health Wales said: “We are delighted that Cwmfelinfach Primary School has received our top health award. They deserve this important recognition for their commitment to embedding health and wellbeing in the culture and fabric of the school. The Welsh Network of Healthy School Schemes is delivered by Public Health Wales on behalf of the Welsh Government.